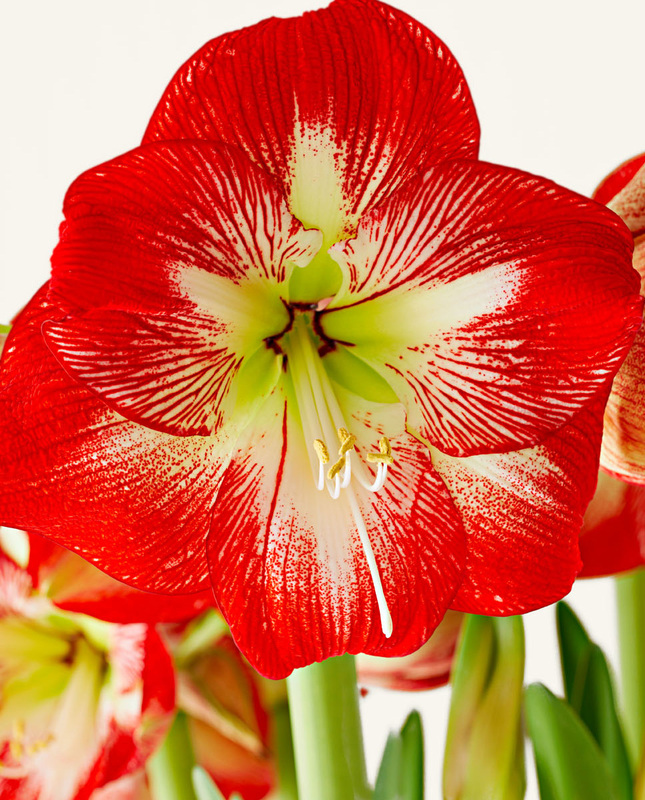 A holiday favorite, easy-to-grow amaryllis heralds the season with a fanfare of spectacular blooms—and new looks. 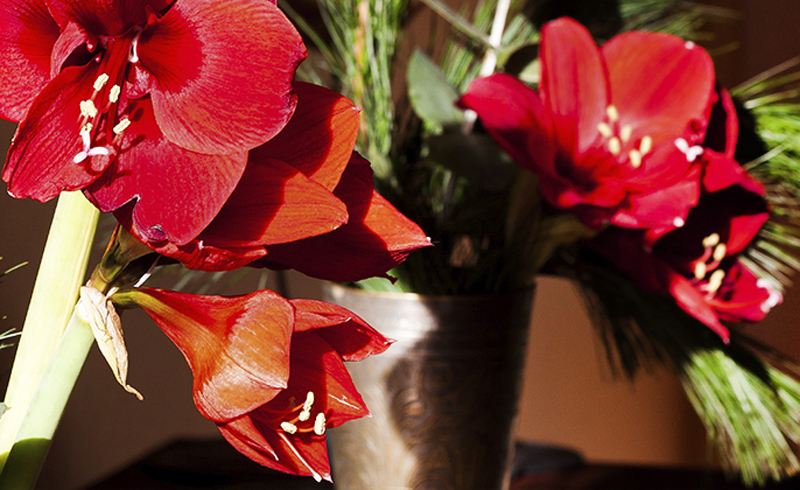 Amaryllis turns heads with its bold midwinter flowers. Stagger plantings every two weeks October through February for nonstop color. Don't let their sublime beauty fool you; amaryllis is possibly the easiest bulb to bring to flower. 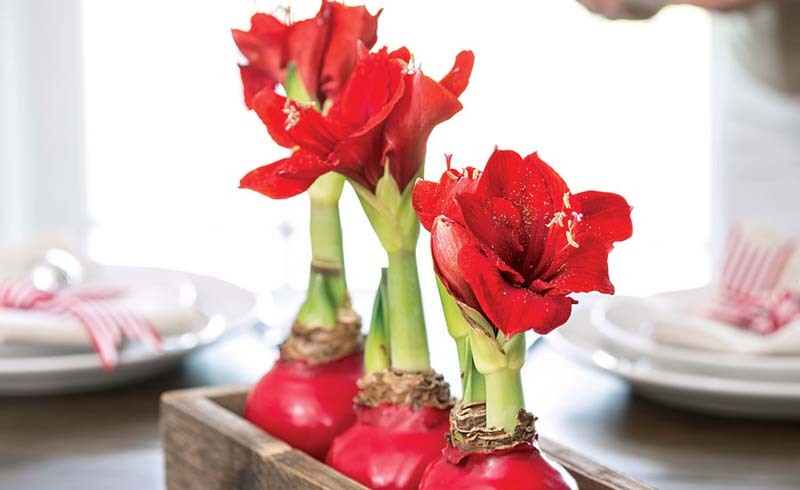 The big easy Eye-catching amaryllis bulbs dipped in colored wax mark a new holiday trend. The coating restricts root growth so plants are shorter than average and live just one season, but serious advantages include a fresh presentation style and no need for water, sunlight, soil or the proverbial green thumb. 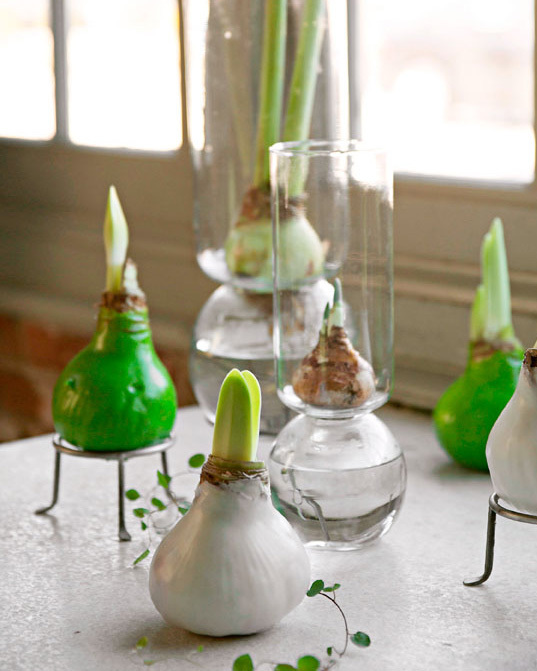 Of course, the traditional method of growing bulbs in glass forcing vases continues to appeal with classic beauty and repeat seasons. 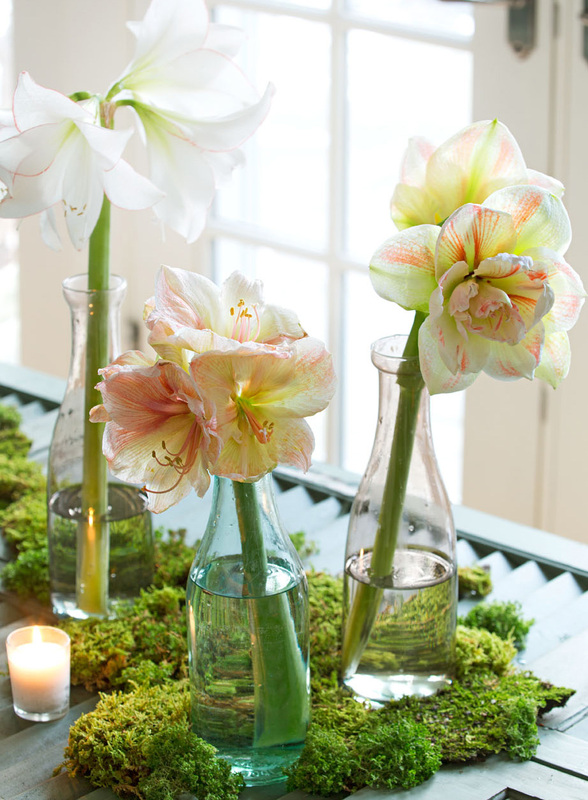 By the stem Amaryllis flowers include both single and double forms and 2- to 10-inch flowers. The cut blooms of ‘Nymph’, ‘Apple Blossom’ and ‘Picotee’ (below, from left) naturally shine on a moss-lined green shutter. Snip when buds just start to unfurl. 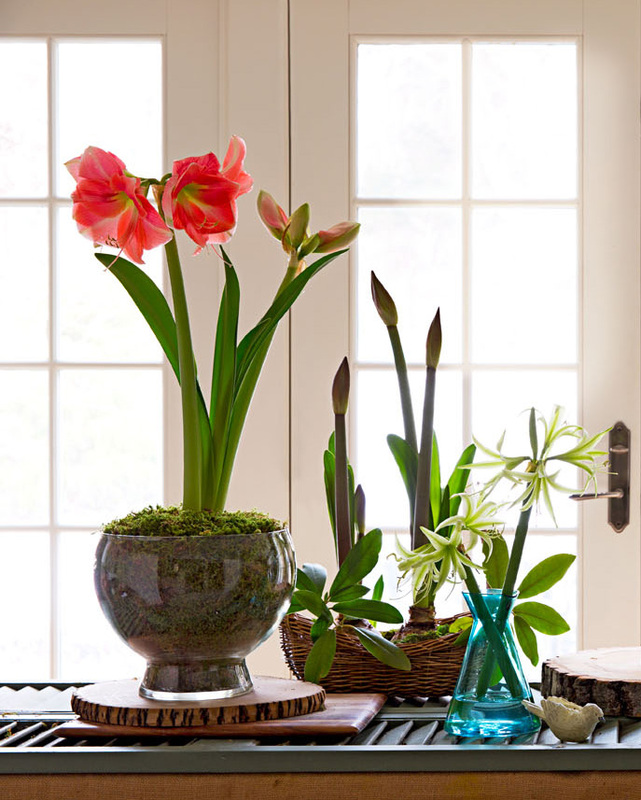 Cut amaryllis lasts up to two weeks if you trim the stems every few days to assist water absorption. Slide a thin dowel inside the hollow stem for support, and plug the base with a wet cotton ball, which draws water to keep the flower moist. The gathering place Group different types for a striking display. The tableau below includes, from left, ‘Summertime’; budding ‘Faro’, which will open with a green eye in a white starburst on salmon petals; and the spider-flower cybister variety ‘Evergreen’. The larger the bulb, the more stalks and blooms you’ll get the first year. Bulbs should be firm and dry. South African amaryllises bloom in four to six weeks; Dutch strains take eight to 12 weeks. To prolong the flowers’ life, move the plant out of direct sunlight when buds show color.